PuzzleMad: Do you want to be a Lunatic? Do you want to be a Lunatic? I'm a lunatic! Do you want to be? There is a new Kickstarter project up and running that I am sure many of you puzzlers out there may want to go and look at! My friend Marcus Allred, sent a couple of these gorgeous puzzles last year and I wrote about them here. 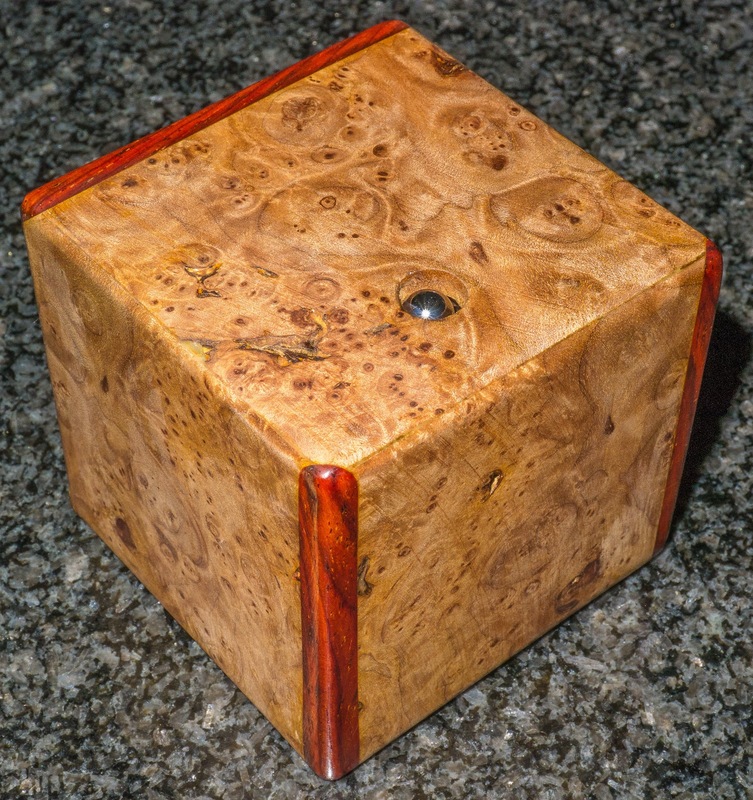 This time there are a variety of price points starting at just $25 for a pocket version (3 x 3 x 1") right up to $320 for your choice of 4 full sized (3 x 3 x 3") hidden mazes made from the most amazing wood burl and there are lots of options in between. Woods available this time include domestic US woods like Maple, Walnut, Cherry, Cedar, Black Ash, Desert Ironwood & Flame Box Elder as well as Exotic woods - Wenge, Amboyna, Cocobolo, Bocote, Malaysian Blackwood, and Honduran Rosewood as well as some fabulous burls. I am such a sucker for beautiful wood that it is making me drool at the thought! I cannot personally vouch for the pocket ones as I have not seen one yet but I am sure they will be a great quality puzzle. You can read below for my experience with the full sized ones. Many people are suspicious of Kickstarter projects but Marcus has run several of them before and been very successful (in July 2012, October 2012 & July 2103). Roxanne wrote about her experience here. The one at the top of the page is one of his hidden maze puzzles made form Bird's-eye maple with Cocobolo accents - within that block there is a series of interconnecting channels ending at a small hole on 2 sides. You can see one ball bearing peeking out above but you are provided with two! There are several possible challenges - the first is to blindly by feel and sound navigate your ball bearing through the maze and out the other side. Easy you think? I thought so too! I started my puzzling with the revomazes and they couldn't possibly be any tougher than that! Could they? Well let me say that I have only managed to solve the puzzle above twice since receiving it and am actually not sure how I managed it!! Then, the task, having gone one way, is to try and reverse the process. No! It's not just a matter of reversing your movements because it depends on where the side branches come off! If you can beat that challenge then try doing it with 2 balls at once! I can't - for some reason they seem to get lost inside! What about doing both in opposite directions - now that is surely impossible!!! Still a Lunatic - just revealed to the world! 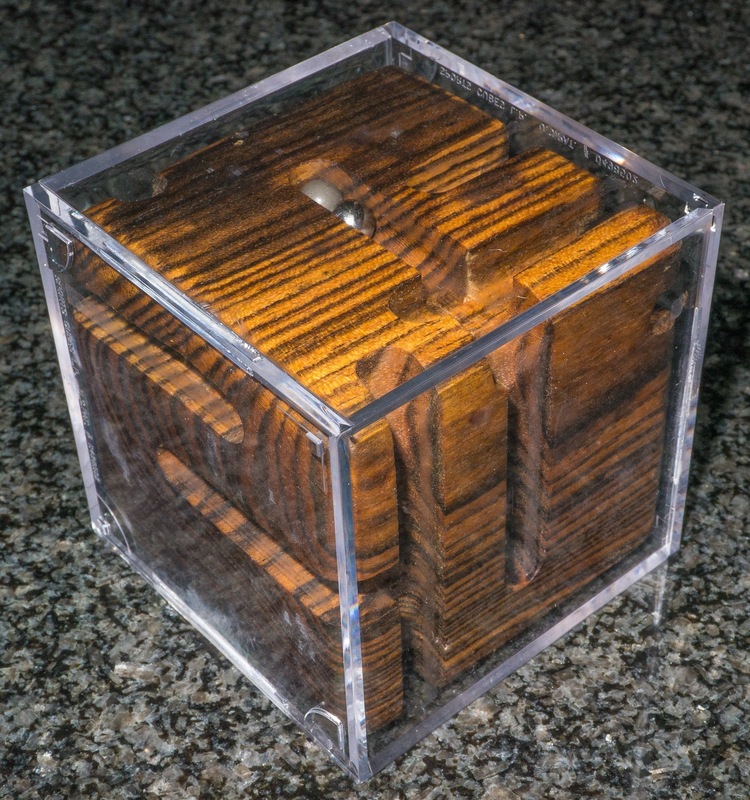 The mazes are also available in a "revealed form" where you can see the maze in all it's glory and the both balls and maze are encased in a perfectly fitting acrylic box. The one above is made (I think) from Bocote. This has very similar aims as the hidden ones and is slightly easier to carry out but adds further challenges: Firstly - navigate both bearings from one end to the next. Then manoeuvre each ball it to opposite ends (very hard to do! ), if you can manage this then try it whilst not allowing the balls to touch each other! Finally each ball must make it to opposite ends without returning to the point of origin, or in other words each ball can not touch the others' destination. 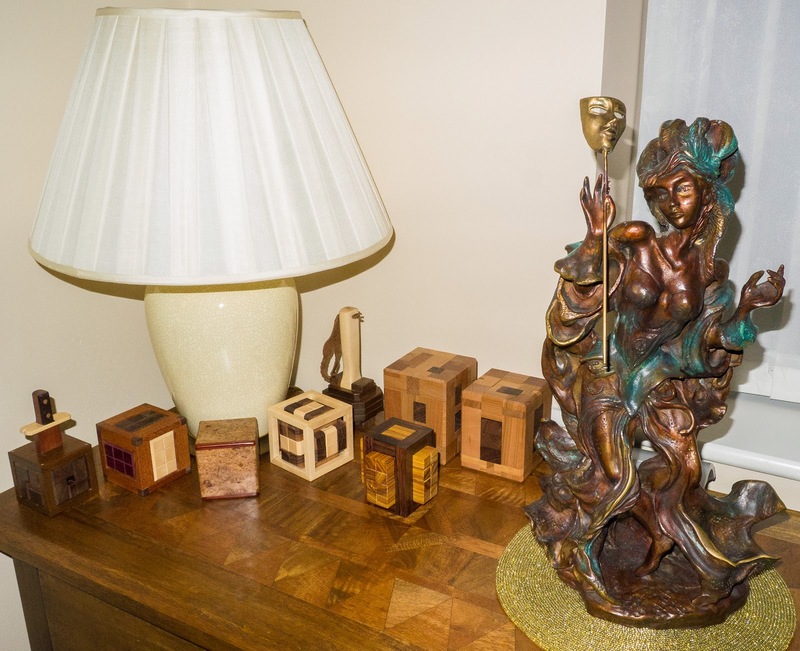 The craftsmanship is superb and the woods are absolutely gorgeous - as a testament to this my Bird's eye maple maze is actually allowed on display in my living room! Mrs S is very discerning! Not once has it been plonked on my keyboard in the study like many other puzzles! Very interesting. I might just go for the pocket version! It least this will look different from the usual cube style puzzles. You won't be disappointed Jerry! I have put my money where my mouth is and also gone for a pocket version as I don't have one of those yet! The circle, the MPP and the Aftermath! OMG! I think I've lost my mojo?